Here's somebody who has greatness. Greatness in many regards. 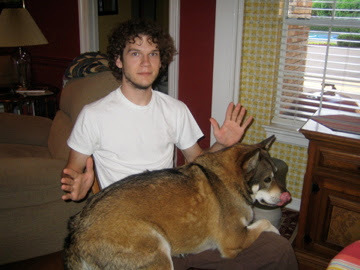 He looks normal here with sweet Shiloh (who he picked out (saved) at the animal shelter), but he's way above normal. For one thing, I know of no one more talented than he. He has an innate ability that will rival anybody. It is incredible. Whether it's playing guitar, bass, banjo, keyboard, even drums, or singing, writing incredible music, engineering music at a sound board, or whatever, he's good. For his birthday he got a steel guitar (they're not just for country or Hawaiian music anymore). He was playing it right away. He marches to his own drummer. He dares to think his own thoughts. Oh, he's hard on himself. Most artists are, but that is part of their greatness, I think. If they weren't geniuses they would go glibly through life never introspecting . . . and never really creating. Will is one of those geniuses. I'm really speaking objectively here - even if he is my son. I like this boy a lot. I'm lucky to know him.